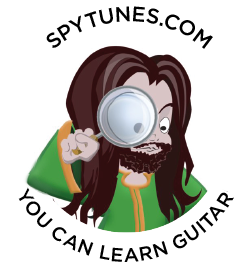 There’s a new Guitar Conspiracy available, I’ve updated it. When I do this to one of the eBooks I always send it out to everyone who bought it, as a free update. “Thanks a lot Guru, this is amazing. I will buy the full method again from time to time to thank you. 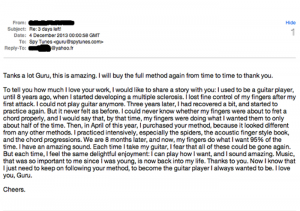 I used to be a guitar player, until 8 years ago, when I started developing multiple sclerosis. I lost fine control of my fingers after my first attack. I could not play the guitar anymore. Three years later, I had recovered a bit and started to practice again. But it never felt as before. I could never know whether my fingers were about to fret a chord properly, and I would say that, by that time, my fingers were doing what I wanted them to only about half of the time. Then, in April of this year, I purchased your method, because it looked different from any other methods. I practised intensively, especially the spiders, the acoustic fingerstyle book, and the chord progressions. We are 8 months later, and now, my fingers do what I want 95% of the time. I have an amazing sound. Each time I take my guitar, I fear that all of these could be gone again. But each time, I feel the same delightful enjoyment: I can play how I want, and I sound amazing. Music, that was so important to me since I was young, is now back into my life. Thanks to you. Now I know that I just need to keep on following your method, to become the guitar player I always wanted to be. I love you, Guru.